Koi are cold water pond fish, descended from carp. Koi owners may need to bring their prized koi indoors during the winter to prevent death in frozen pond water. Keep koi in large aquariums for a few months at a time. If you live in an apartments, you may have to keep koi in aquariums for their entire life. That is possible, as long as you do not overcrowd the aquarium with too many koi. 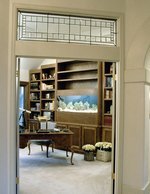 Put the aquarium on a stand that can support the weight of the tank, and find a location in your home that can accommodate the weight of the tank safely, such as near a support wall or on a concrete basement floor. Place a substrate layer at the bottom of the tank at least 2 inches deep. Use a mixture of small gravel and larger gravel or rock pieces. Koi are bottom-feeders, and will enjoy sifting through the substrate. 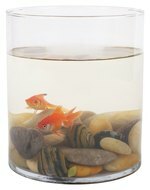 Install an external filter to the aquarium that is made for the number of gallons in your tank. You may choose to use a carbon filter, as well, to remove toxins and impurities in the water. Install an aquarium heater to regulate the temperature. Although koi can withstand water below 40 degrees and above 80 degrees, koi kept indoors should have a heater regulating the temperature to 68 to 77 degrees. That will maintain the metabolism at a good level. Keep an aquarium cover on top of the tank at all times to prevent koi from jumping out. Use a cover with a light inside since koi also need 12 hours of light a day. Test the water's pH regularly. Koi like a neutral pH between 7 and 9. Add pH stabilizer to the tank water if the pH gets too low. Perform partial water changes weekly. Remove 10 to 20 percent of the tank water and then top off the tank with tap water, adding dechlorinator to the new water before pouring it into the tank. Well water not been treated with chlorine may not need a dechlorinator. However, let the well water sit out for several hours, and then test the pH. Treat the water with pH stabilizer if it is below 7. Feed the koi only what they can eat in five minutes. Overfeeding will pollute the water.